We're up against a total unknown tomorrow evening when we travel to the outskirts of Leeds to play Farsley Celtic. The side known to their fans as the Villagers, ironically also the same name that Histon fans give to their team - how tinpot? ?, came up from the Conference North last season along with Droylsden and like them have failed to set the League alight but to their credit are holding their own. They've had a couple of wins against similar opposition but when they played the first of the big boys, Cambridge Utd, they lost out by 5-1. Reports from other fans say that they're a hard side to break down but once you've made the breakthrough then they tend to go to pieces. The one thing in their favour is that they have the former Harrier Mark Jackson in their ranks. He left us to go to Rochdale in the double deal along with Iyseden Christie but in his first game for them he broke his leg and missed the remainder of the season. Once recovered he never got back into the Dale side on a regular basis and was released to join Farsley in July. 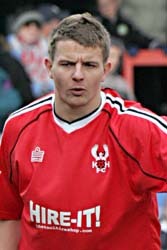 Also playing for them is the former Halifax midfielder Ryan Sugden and Tris Whitman formerly of Tamworth and Hinckley. We're starting to hit a rich vein of form now with two good results in the last two games. The win at Rushden was good but the thrashing of Exeter City at Aggborough on Saturday will probably live in the memories of Harriers fans for a long time. The whole team played well against City and it's unfair to single out one player but special mention must got to James Constable. His hat trick was sheer class and now he's off the mark no doubt he'll be raring to get more goals. We only have a couple of injuries. Brian Smikle missed the game Saturday with an ankle injury and Simon Russell has been out all season so far and is still a few weeks away from a comeback. Celtic have Damien Dunne out with a fractured cheekbone, Carl Serrant and Scott McNiven are also both out injured. Farsley also have the chance to play one of three goalkeepers after signing Mark Wilberforce from Scarborough just before the recent deadline and also having Tom Morgan and Paul Cuss fighting over the first team spot. This is going to be a tough game at a new venue against a club very new to all of us. I think that we have our tails up now and Celtic are going to have to be very strong to stop us winning our third game on the trot. Bevan, Coleman, Harkness, Kenna, Bignot, Creighton, Whitehead, Munday, McGrath, Ferrell, Bennett, Hurren, Russell, Penn, Richards, Blackwood, Barnes-Homer, Smikle, Christie, Constable. Morgan, Cuss, Wilberforce, Sutcliffe, Jackson, Lloyd, Iqbal, Crossley, Knowles, Bambrook, Reeves, Grant, Watson, Stabb, Stamer, Sugden, Allanson, Downes, Tuck, Thackray, R Serrant, Whitman, Law, Camfield, McGuire, Cooper, Smith, Billy.